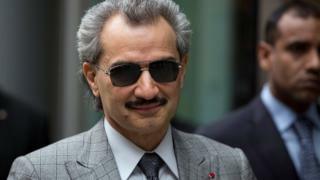 The heir to the throne in Saudi Arabia has consolidated his hold on power with a major purge of the kingdom's political and business leadership. Attorney General Sheikh Saud al-Mojeb said the status of the detainees would not influence "the firm and fair application of justice", AFP news agency reports. Saudi broadcaster Al-Arabiya said fresh investigations had been launched into the 2009 Jeddah floods and the outbreak of the Mers virus which emerged in Saudi Arabia in 2012 - but analysts see the detentions as a clear move by the crown prince to strengthen his power base. Who is Crown Prince Mohammed bin Salman? The events of Saturday night in Saudi Arabia are nothing short of seismic for that country. In a bold, pre-planned move, the 32-year old Crown Prince has removed the final obstacles to his gaining total control over the world's richest oil producer and home to the holiest shrines in Islam. The owner of London's Savoy hotel is one of the richest men in the world, with a net worth of $17bn (£13bn) according to Forbes. The firm is one of Saudi Arabia's most important investors. Apart from Twitter and Apple, it has shares in Citigroup bank, the Four Seasons hotel chain and ride-sharing service Lyft. Mr Trump, who was born into a family of property developers, shot back with a tweet mocking the source of the prince's wealth. However, after Mr Trump's election last November, the prince sent "congratulations and best wishes". Prince Miteb, son of the late King Abdullah, was once seen as a contender for the throne and was the last member of Abdullah's branch of the family in the highest echelons of Saudi government. He recently said the return of "moderate Islam" was key to his plans to modernise Saudi Arabia. Addressing an economic conference in Riyadh, he vowed to "eradicate the remnants of extremism very soon".